Most apps and websites contain much functionality that’s tedious to implement and has been done thousands of times before. MongoDB Stitch takes care of a lot of these chores – for example, making it simple to interact with third-party APIs. This post explains how I used Stitch to do just that that this week. I recently described how I ported my legacy website to Stitch. After reading that post, one of our Paris Solution Architects spotted that there was a bug in how I was validating phone numbers in my forms (specific to France’s dialling plan). I was about to go into my code to tweak the regular expressions to cope with French phone numbers. However, what if there was another country with odd rules? What if the rules changed? It then struck me that this is precisely the kind of chore that I should use Stitch to replace – being an expert in regular expressions and country-specific dialling plans wasn’t going to make the experience any better for my users, and so I should contract it out to “someone” else. 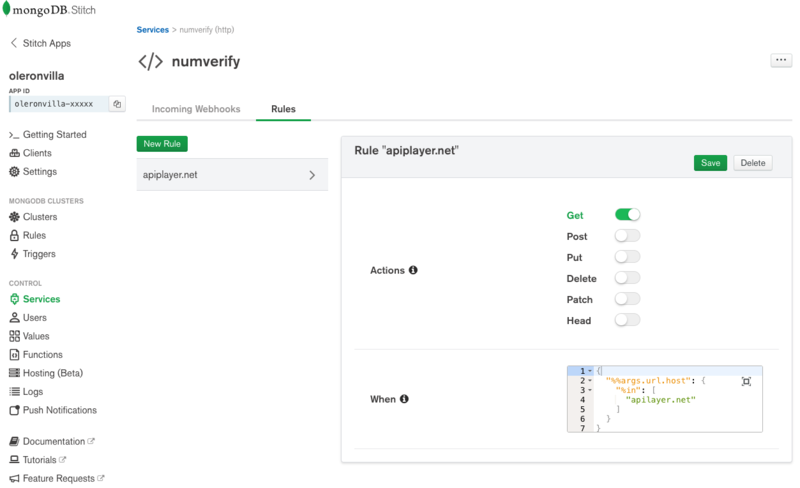 A quick Google later, and I’d settled on the NumVerify service which provides an API to validate phone numbers and add some extra information such as the type of line and the same number in full international format. Note that numverifyAPIKey is a Stitch Value that I’ve set to the API key I received when registering with NumVerify. NumVerify is as flexible as possible in accepting phone numbers in different formats. It also sets the resulting international_format field to a fully formatted international number – I use that to replace the user-provided number in the form, ensuring that all numbers stored in Atlas are in the same format. In one swoop, I’ve ripped out my spaghetti regular expression code, made the validations more robust, and added a new feature (normalizing the phone numbers before I store them) – result! See the results at stitch.oleronvilla.com, but please don’t judge my code, I still need to delegate a lot more to Stitch and other services! From the start, Stitch has been great at serving up dynamic content and interacting with backend services. 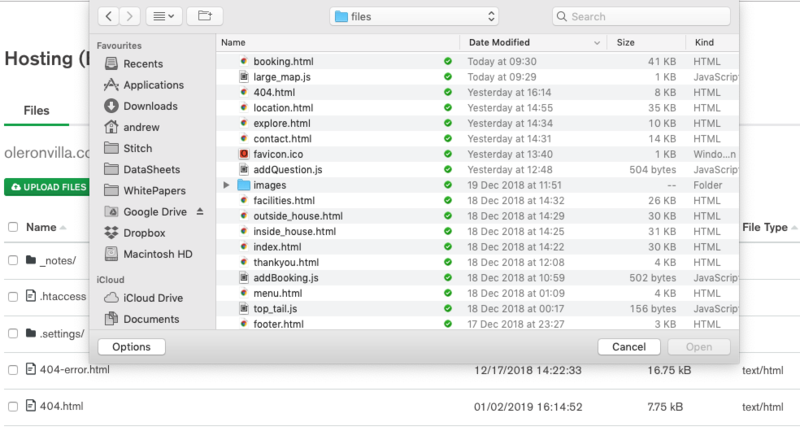 There was just one piece missing that meant that you still needed an app server or hosting service – storing and serving up your static assets (index.html, style.css, logo.png, etc.). The recent addition of Stitch Hosting, currently in beta, fixes that! const body = "New booking from "
+ " for these weeks: " + request.requestedDates.toString() + ". " + " or email " + request.contact.email + ". " Note that I used the Stitch option to bring my own domain name. See the results at stitch.oleronvilla.com, but please don’t judge my code! 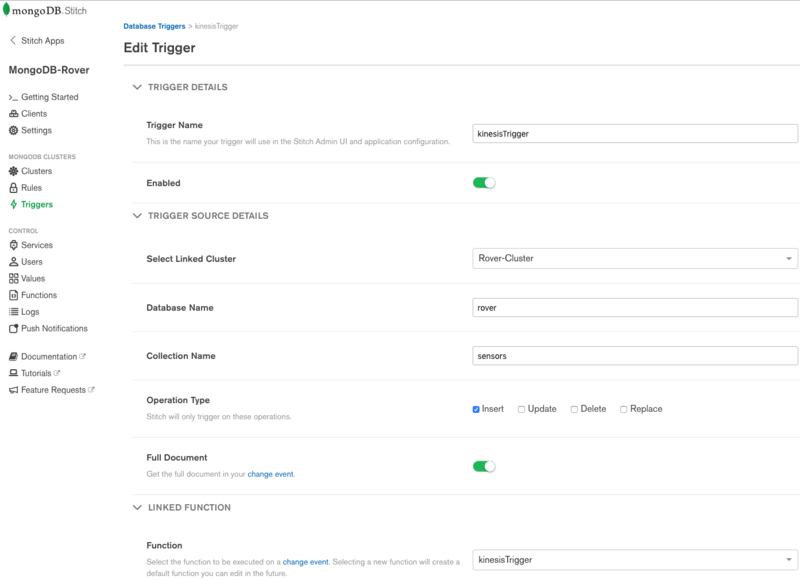 This post delves into using MongoDB Stitch Triggers and the Stitch AWS service to push MongoDB database changes to Amazon Kinesis. 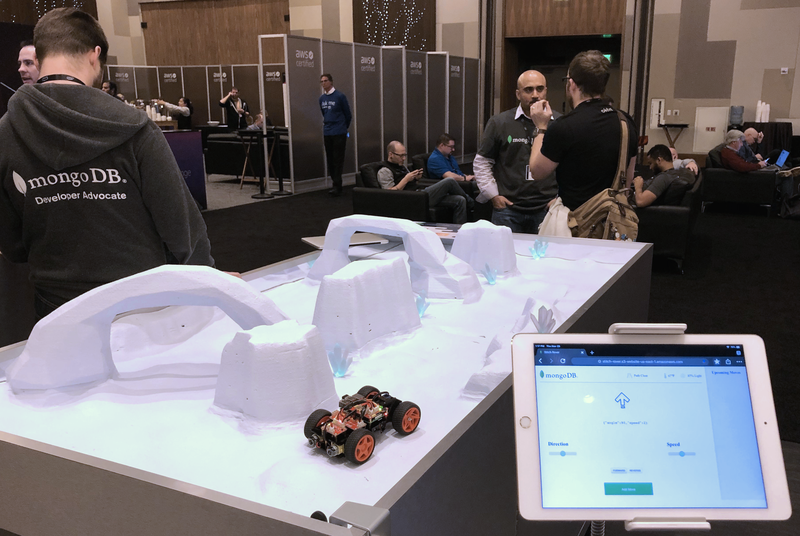 This is the fifth and final article in a series of blog posts examining how the MongoDB Mobile/Stitch-controlled rover was put together for our AWS re:Invent demo. As the rover will sometimes be disconnected from the network, it stores the readings locally in the MongoDB Mobile database. Stitch Mobile Sync will then sync these same documents to Atlas whenever it’s online. We’ve configured the kinesisTrigger trigger to fire whenever a new document is added to the rover.sensors collection. The trigger calls the linked function KinesisTrigger (the trigger and function names don’t need to match), passing the inserted document as a function argument. From the time that the Stitch Trigger is hit, it typically takes just 20ms to get the data into Kinesis. – MongoDB Stitch/Mobile Mars Rover Lands at AWS re:Invent describes how MongoDB Stitch, MongoDB Mobile, Atlas, Android Things, a Raspberry Pi, and Amazon Kinesis are used to reliably control our Mars rover. 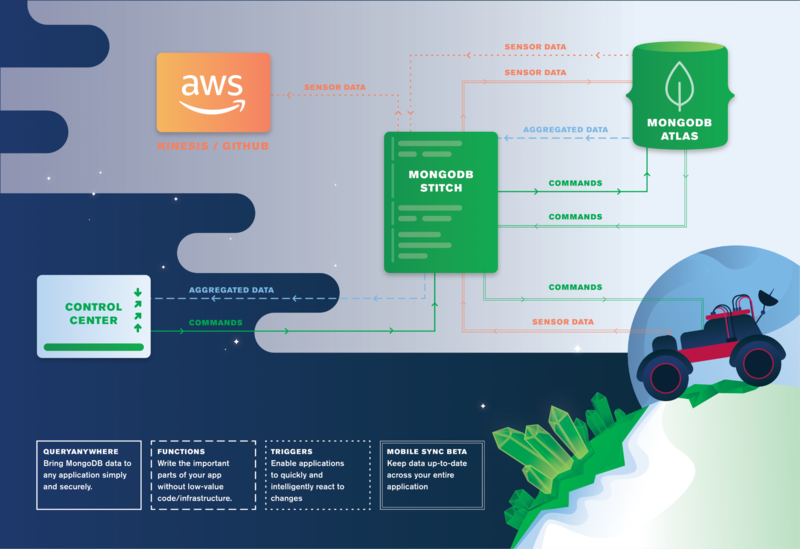 – MongoDB Stitch QueryAnywhere focuses on how the Mission Control app records the user commands in MongoDB Atlas by calling the Stitch SDK directly from the frontend code. – MongoDB Stitch Mobile Sync shows how Stitch Mobile Sync synchronizes the user commands written to MongoDB Atlas by the Mission Control app with the MongoDB Mobile database embedded in the rover (and how it syncs the data back to Atlas when it’s updated in MongoDB Mobile). – MongoDB Stitch Functions focuses on how a Stitch Function is used to provide aggregated sensor data such as the average temperature for the last 5 minutes. 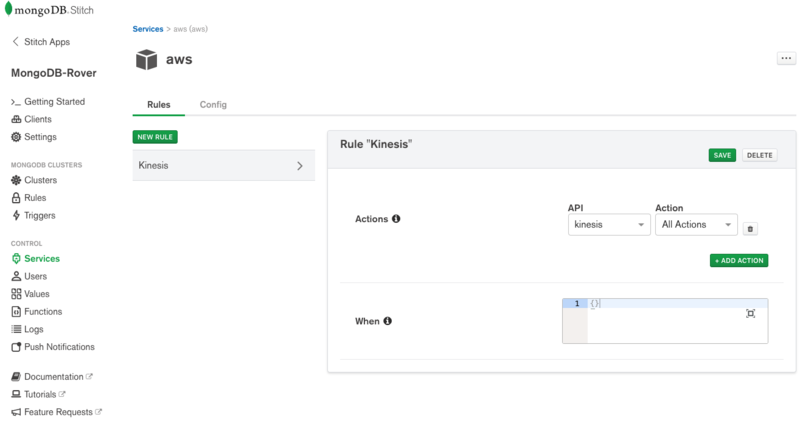 – MongoDB Stitch Triggers & Amazon Kinesis shows how we use MongoDB Stitch Triggers and the Stitch AWS service to push MongoDB database changes to Amazon Kinesis. You can find all of the code in the Stitch Rover GitHub repo. Why not try Stitch out for yourself. 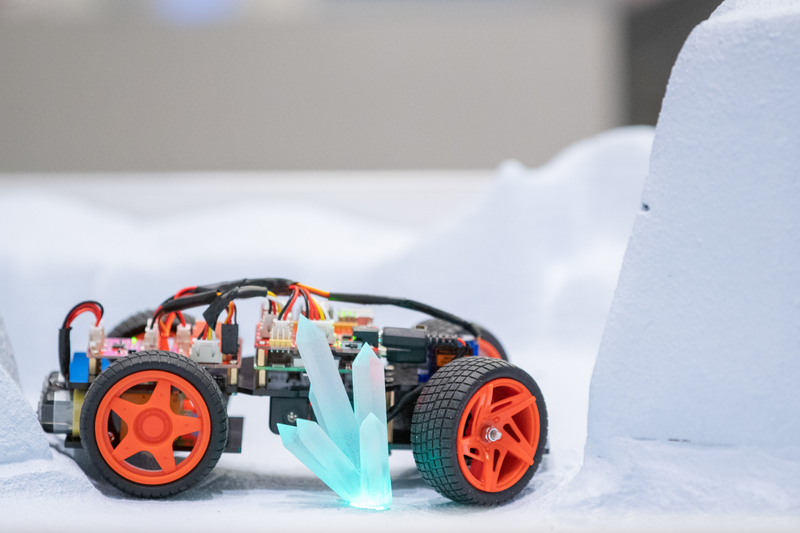 This is the fourth in a series of blog posts examining how the MongoDB Mobile/Stitch-controlled rover was put together for our re:Invent demo. This post focuses on how a Stitch Function is used to provide aggregated sensor data such as the average temperature for the last 5 minutes. A common question we were asked at re:Invent is how Stitch’s serverless Functions compare with AWS Lambda functions. Stitch functions are designed to be very light-weight (run as Goroutines and deliver low latency – ideal, for example, when working with a database (especially as your function has a persistent MongoDB connection). In contrast, Lambda functions are more heavy-weight (Lambda spins up containers to run your functions in) – better suited to compute-heavy operations. There’s a lot more that you can do in functions, such as sending data to another cloud service. You’ll see an example of this in the next post which shows how a Stitch Trigger calls a Stitch function to send MongoDB Atlas data to AWS Kinesis. If you can’t wait then you can find all of the code in the Stitch Rover GitHub repo. At AWS re:Invent, we demonstrated how MongoDB Mobile, MongoDB Stitch, and AWS services could be used to build a cloud-controlled Mars rover – read the overview post for the setup. 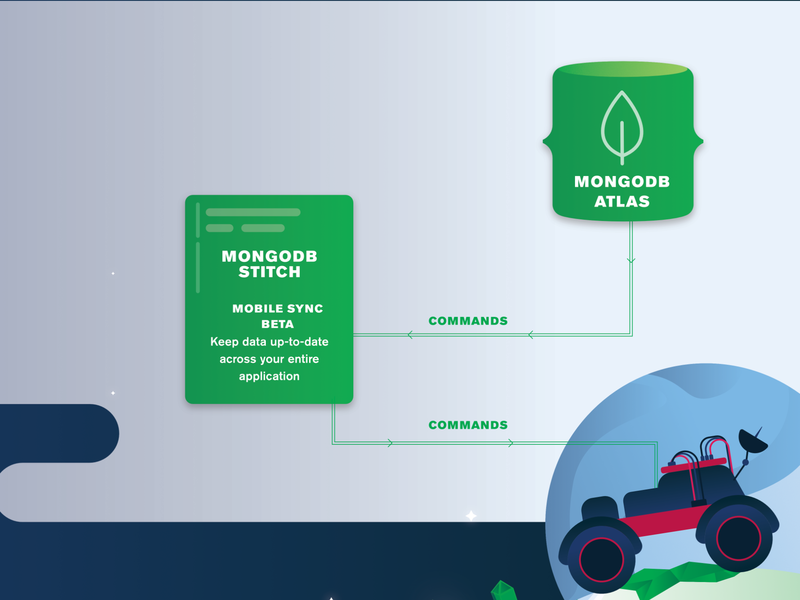 This post focuses on how Stitch Mobile Sync synchronizes the user commands written to MongoDB Atlas by the Mission Control app with the MongoDB Mobile database embedded in the rover (and how it syncs the data back to Atlas when it’s updated in MongoDB Mobile). Many people who took part in the demo at re:Invent asked why Mission Control wrote the commands to Atlas rather than sending them directly to the rover. The reason is that you can’t guarantee that the rover will always have network access (and when thousands descended on the expo hall for the Monday evening social, we learned that maintaining a connection over conference WiFi can be just as tricky as maintaining one to Mars). The commands are stored in Atlas and then synchronized to the rover whenever it’s online. You may have noticed that the same document is being updated in both Atlas and MongoDB Mobile, raising the possibility of conflicts. A conflict occurs when the document is updated in one database and, before that change has been synced, the same document is updated in the second. Sketchy network connectivity increases the size of the window where this can happen and that makes conflicts more likely. // and including the last completed move. The next post in this series looks at how Stitch Functions can be used to provide an aggregated view of the rover’s sensor data. At AWS re:Invent, we demonstrated how MongoDB Mobile, MongoDB Stitch, and AWS services could be used to build a cloud-controlled Mars rover – read the overview post for the setup. This post focuses on how the mission control app records the user commands in MongoDB Atlas. Mission Control is a simple web application that we ran on an iPad. The web app takes commands from the user through its UI which displays directions for the rover to travel in. Each command sets the rover off in that direction for a short fixed amount of time. Rather than sending the command directly to the rover, and as Mars is a long way away and network connections are not always reliable, the app stores the commands in an array within the rover’s document in Atlas – in that way, commands can be queued up and sent to the rover as soon as it’s back online. A traditional way of access the database from the frontend app would be to stand up an app server, implement a custom REST API and data access control layer, and then send the commands to it from the frontend app. MongoDB Stitch massively simplifies that workflow by letting a web (or mobile) app execute MongoDB Query Language operations directly – removing the need for thousands of lines of boilerplate code. When we explained this access model to demo visitors, some were nervous about this approach as we’ve been taught that the schema and database access should be hidden from the frontend (remember SQL injection attacks?). Fortunately, Stitch QueryAnywhere is made up of two components – the first is the Stitch SDK that enables direct access to the database, the second is the sophisticated, fine-grained user access controls provided by the Stitch service. If that doesn’t allay your fears then you have the option to obfuscate the schema by accessing the database through Stitch Functions. If you are used to working with the MongoDB Query Language from an app server, that should seem very familiar. The only thing that might catch your eye is that __stitch_sync_version.v. That’s part of how this update will get to the MongoDB Mobile database embedded in the rover. We’ll explain that in the next part. 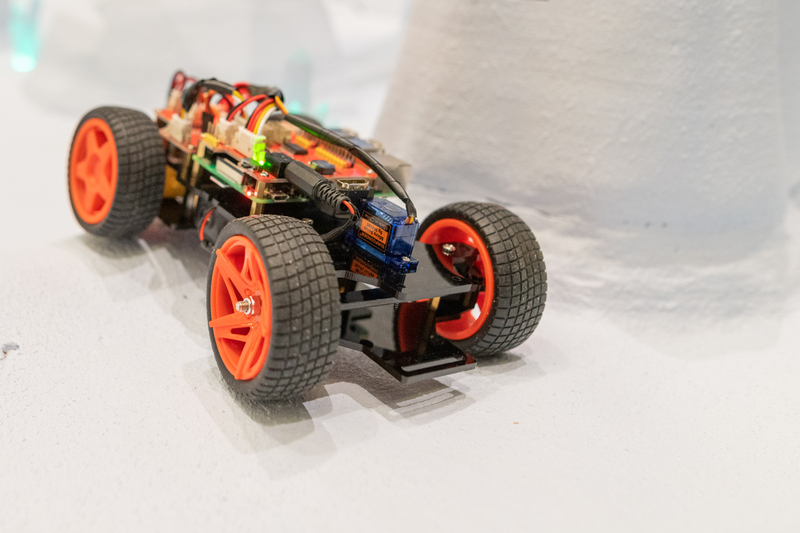 Powered by MongoDB Mobile, MongoDB Stitch, and AWS Kinesis, the MongoDB rover debuted at AWS re:Invent. More than a thousand people stopped by our demo to see if they could navigate the rover around a treacherous alien landscape. One of the challenges in controlling a rover on the other side of the Solar System is that there will frequently be times when you lose connectivity. To solve that, we store all of the commands in MongoDB Atlas and sync them to the rover (in its local MongoDB Mobile database) whenever it’s contactable. After the commands are sent to the cloud, Stitch Mobile Sync takes over, ensuring all commands are automatically written to the MongoDB Mobile database embedded on the rover (running Android Things on a Raspberry Pi 3b) by Stitch Mobile Sync. The Java app on the rover then acts on the synced commands (moving the Rover), before removing them from the mobile database to reflect that it’s completed with that set of commands – with the updated status then finally synced back to Atlas by Stitch Mobile Sync. The rover can also record environmental sensor data in MongoDB Mobile, which Stitch Mobile Sync syncs to the sensors collection in Atlas. A Stitch Trigger on the sensors collection then runs a Stitch Function to push those sensor readings to AWS Kinesis for further analysis, such as anomaly detection. The first appearance of the MongoDB rover coincided with the Mars landing of InSight. 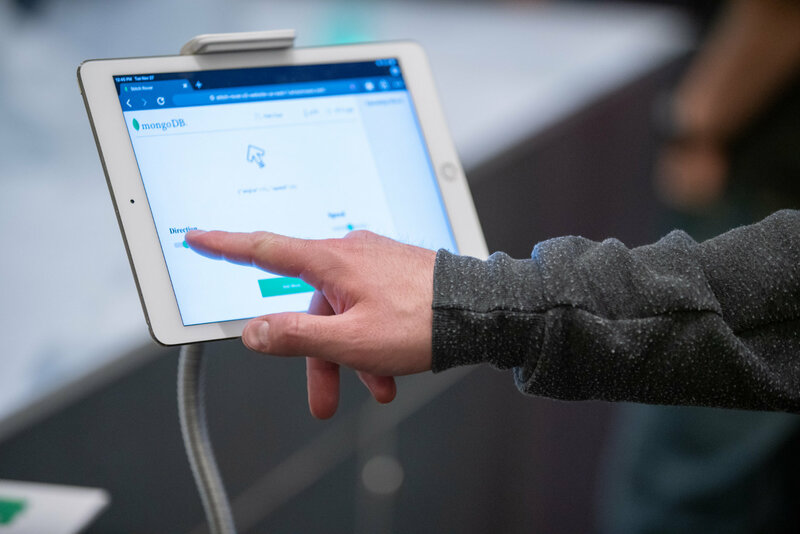 We even had our own 7 minutes of terror when the event WiFi buckled under the pressure of thousands of delegates descending on the expo hall during Monday’s evening social – but it did at least demonstrate that Stitch Mobile Sync quickly catches up once connectivity is restored. This post is the first in a series delving into the components of this interactive demo, and if you can’t wait for more details, then you can find all of the code in GitHub. How do you test MongoDB Stitch functions, how do you store Stitch triggers, and what services can you integrate Stitch with? These were some of the great questions that were asked and answered in my recent webinar. You can watch the replay of “MongoDB Mobile and MongoDB Stitch – Introduction and Latest Developments” here, or read on as I share the answers to those questions here. For those new to MongoDB Stitch, it’s the serverless platform from MongoDB that isolates complexity and ‘plumbing’ so you can build applications faster. Stitch went GA in June 2018, and we recently added a set of new capabilities, including global Stitch apps, more AWS services, a React Native SDK, and the beta for Stitch Mobile Sync. MongoDB Mobile is an embedded version of the MongoDB database that you can embed in your mobile or IoT apps. How do you test Stitch functions? The Stitch UI includes a console which can be used to test your Stitch functions; you can include console.log statements to add extra debug output to the console (they also get added to the log files for every function invoked from an incoming webhook, trigger, or the Stitch SDK). You can read more about this in this post which takes you through the process. How do you store stitch triggers in your Git repo? 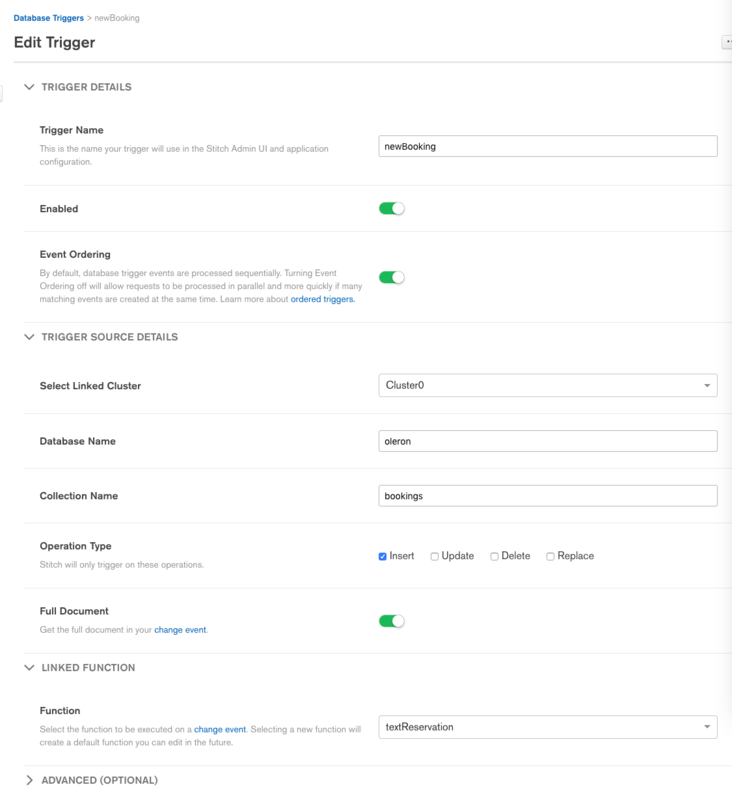 You can then work on the trigger configuration and the associated function locally, source control the app using Git, or import it into a new App. We saw a few integration provider logos in the presentation. Is there a page on the MongoDB site with the comprehensive list? You can find the list of Stitch’s built-in service integrations in the Stitch documentation. Note that if we don’t have a built-in integration for a particular service, then you can easily integrate it yourself, using the Stitch HTTP service and incoming webhooks. You can even export your new service integration to share with others. Is MongoDB Mobile + Stitch Mobile Sync the same as a cache in a progressive app? It certainly removes the need to have a separate cache, but it does much more. 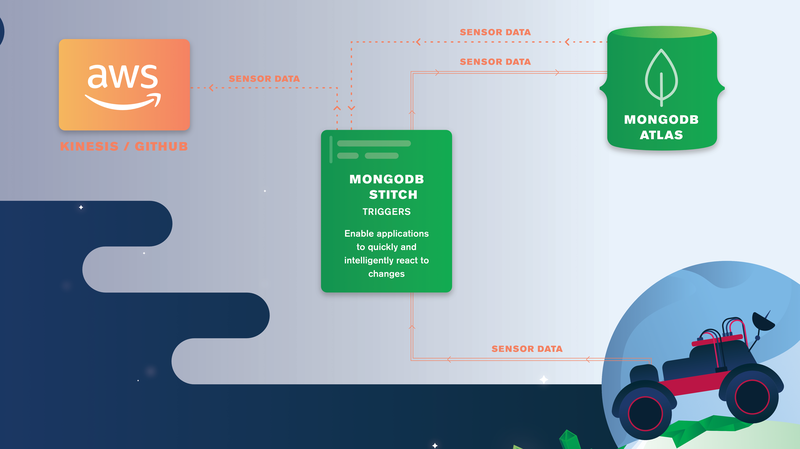 With MongoDB Mobile, the data is persistently stored on your device. You also have the full power of the MongoDB Query Language to perform sophisticated queries and aggregations on that local data. Changes made to the local database are pushed back to MongoDB Atlas, and from there to any other mobile devices configured to sync the same documents (e.g., for the same user running the app on another device). How do I download & embed MongoDB Mobile? You simply need to add 1 line to your Android or Xcode project to have access to the entire Stitch SDK, including the Stitch Local Database service (i.e.,the MongoDB Mobile database). 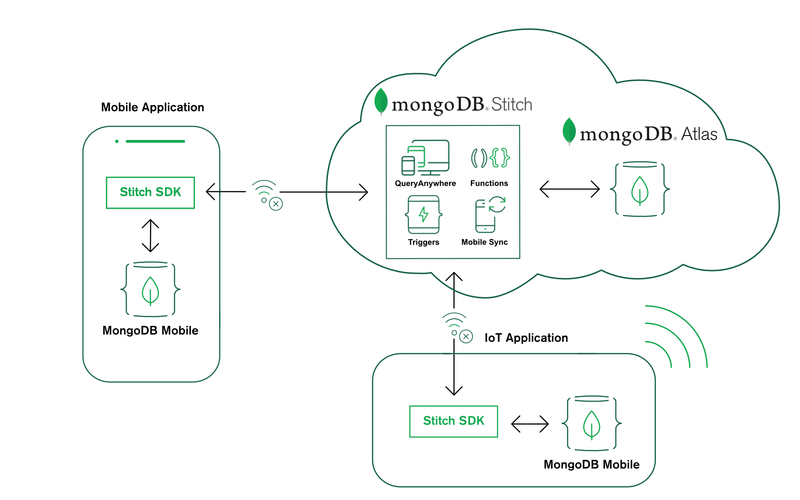 The Stitch SDK includes the entire mobile and makes it very easy to use and consume, even if you’re just using the local MongoDB Mobile database and not Stitch. But, what if you are developing in another language – perhaps running on an app server? Luckily, MongoDB Stitch now supports the MongoDB wire protocol – meaning that you can continue to work with your favorite MongoDB drivers (such as PyMongo) and tools such as the mongo shell.